The 2018 annual Michigan LMSC state awards were awarded at the state meet at EMU. Gail Dummer, this year’s recipient of the Michigan Masters Lifetime Achievement Award, has been involved with four different Clubs in four different LMSC’s and has been a Michigan Masters member since 1986. She was also the co-editor of the first national USMS Rule Book in 1989 and editor of the adapted swimming appendix in the USMS Rule Book in 1995. For those achievements at the national level along with other contributions, she was awarded the 1993 USMS Ransom J. Arthur Award. For the previous eight years, she has been Meet Director for the John Munley Memorial Masters Swim Meet. Since 2010, this meet has become the major fundraiser for swimming scholarships at Michigan State University. In 2012, she was a major contributor on the Michigan LMSC By-Laws, Policies and Procedures update. In addition to US Masters Swimming, Gail has also been involved in USA-Swimming since 1990 in variety of positions at both the local and national levels, including 20 years on the USA Swimming Disabilities Committee. 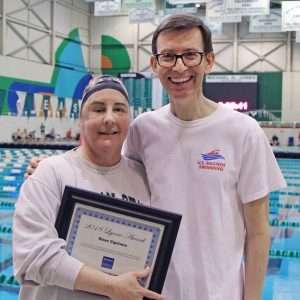 For these many accomplishments, contributions to the swimming community and much more, the Michigan LMSC was pleased to award the 2018 Michigan Masters Lifetime Achievement Award to Gail Dummer. The criterion for the Michigan Masters Lawrence Award is outstanding performances in USMS National and International competitions over the most recent year. This year’s winner started swimming in USMS in 1997 and has been a continuous member ever since. In 2007, he had his first beak out year achieving three 2nd place and one 3rd place rankings in the USMS Top Ten listings. In 2012, he achieved two 2nd place and four 3rd place rankings. In 2017 he had the best year of his masters swimming career with five 1st place, five 2nd place, and one 3rd place rankings in the USMS Top Ten. At the 2017 FINA Masters World Swimming Championships, he won the 400 IM, and was 2nd in the 200 Fly, 200 Back, and 200 IM. Then, in his last Worlds event, he placed third in the 100 Back. No other Michigan Masters swimmer achieved this level of overall success in 2017. Additionally, he was also a member of 2 Relays that broke USMS National and FINA World Masters records. To date, he has 130 USMS Top Ten Swims and achieved his first USMS All American selection this year after winning 5 individual events. For all these accomplishments in his stellar 2017 year, the Michigan LMSC was happy to award this year’s Lawrence Award to Eric Lokensgard. The recipient of the annual Michigan Masters Chetrick Award is an individual who has exhibited outstanding service and continuous voluntary contributions to the Michigan LMSC. This year’s winner has been a registered USMS swimmer since 2010 and since joining eight years ago, he has expanded the types of events he swims from Freestyle all other strokes – Backstroke, Fly and IM. In addition to expanding his swimming skills, he has also increased his participation at the volunteer level of masters swimming. In 2016, the position of LMSC Treasurer became vacant right in the middle of the two year term. Upon seeing a need for help with this vacancy, he stepped up and volunteered to take over all duties of the Treasurer’s position. He quickly learned the duties and responsibilities of the Treasurer’s position and executed the functions in a timely and detailed manner. His ambitious effort allowed him to quickly get up to speed and fulfill the term until the next board election. In 2017, he was elected as Treasurer for a full 2 year term, where he now is serving and fulfilling the role of Treasurer of the LMSC in exemplary fashion. 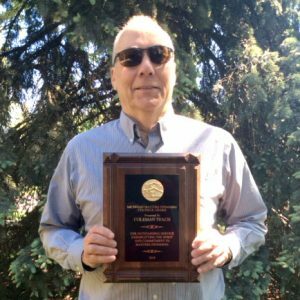 For all these achievements and his great volunteer spirit, the 2018 Chetrick Award went Coleman Teach. This year’s 2018 Michigan Masters State Meet is the first meet Rose Cipriano has swum in since the Michigan Masters State Meet in March 2012. Before today, Rose has been back in the pool at the Farmington YMCA for a few years, here and there, when she can find the time to get back in the water. She began training more last summer in an outdoor pool and noticed she was finally gaining some speed. She began to think about competing again, but has been reluctant since was was not certain she could dive in off the blocks (due to her previous head injuries). If you are not aware of Rose’s story from April 2012, you can find her complete story by visiting the Cipriano Children’s Trust website for more information or the Cipriano Support Page on Facebook. Before joining masters, Rose was an accomplished swimmer who had been inducted into the Central Michigan University Hall of Fame for her college swimming and had just returned to competing in Masters Swimming again (when her daughter was about 8) at the time of her family’s tragedy. Now, in 2018, she is being honored once again. The Michigan Masters Lynne Award was initiated in 1999 and is named after former Michigan Masters President Lynne Weir. 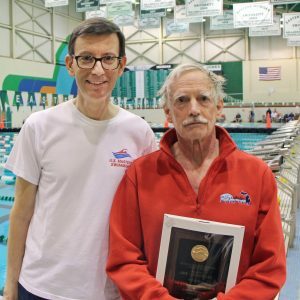 The award is presented to a Michigan Masters Swimmer who has displayed “courage and tenacity” by returning to swim after a major illness or injury. 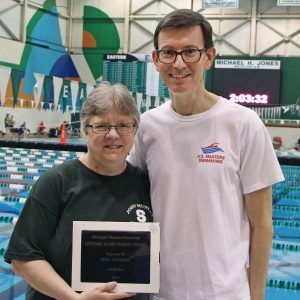 For everything she has done up to her return this year at the State Meet, the Michigan LMSC was proud to award the 2018 Lynne Award to Rose Cipriano.